Figure 1. Concord Bud Development. Cluster initiation (arrows) in green shoots begins just after bloom, and by just before veraison, the buds reach stage 6 of 15. After the winter dormancy and bud break the following season, buds pick back up and finish developing via shoot emergence and growth by bloom, at which point the cycle begins anew. *Dates on x-axis are approximate for each season. Adapted from Goffinet, Wine East 2001. Regardless of the variety to be planted, a grower will need to be sure to install a trellis (the physical structure to which the vines are attached) within the first year of planting. This will enable easier handling of the vines, as well as improve weed and pest management techniques and efficacy in the first two years of growth. Deciding as early as possible will enable growers to calculate the amount of materials needed. 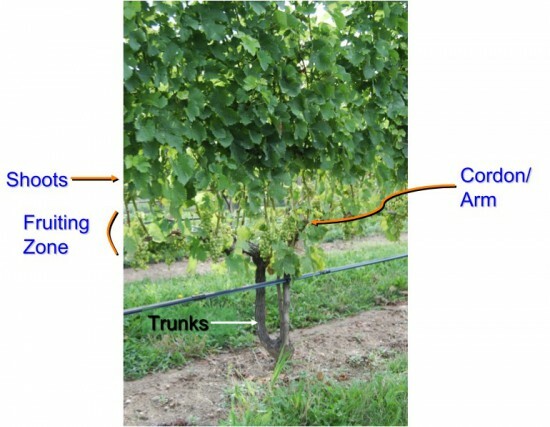 Figure 2 depicts a few training systems, with the most commonly used in NY being top wire cordon (juice grapes, hybrids, vines with procumbent growth habits) and mid-wire cordon, or VSP (Vitis vinifera varieties, some hybrids with upright growth habits). Figure 2. Training systems for grape vineyards. 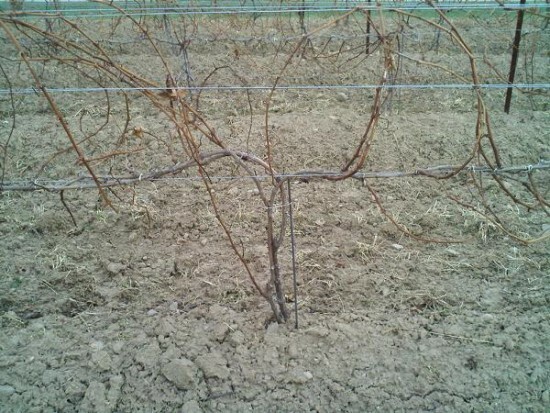 Image taken from Training Systems for New York Vineyards page from Dr. Bob Pool's Grape Pages. Variety selection can also dictate training system options. For example, many of the varieties native to the US and their hybrids have procombent growth habits, meaning, then tend to grow toward the vineyard floor. In these cases, a top wire cordon system can maximize sunlight interception, thus increasing fruitfulness in these varieties. Conversely, Vitis vinifera varieties tend to have upright growth habits, lending themselves to a vertical shoot positioning (VSP) system. (Figure 3) Either of these training systems can be expanded to manage excessive vigor, though dividing the canopies horizontally, as seen in Figure 4. Figure 3. Choose the appropriate training system for each variety planted. 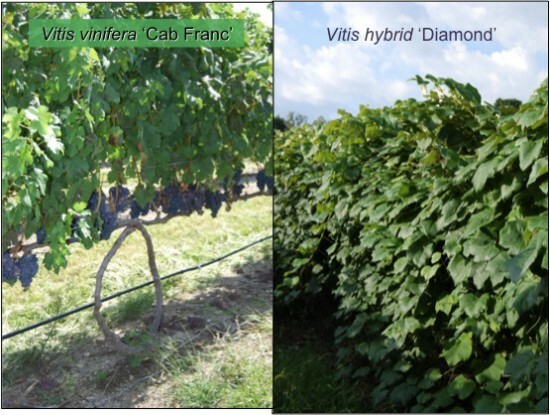 'Cabernet Franc' is better suited to vertical shoot positioning (VSP) systems, while the hybrid 'Diamond' is best suited to top wire cordon training. Figure 4. For overly vigorous sites, separating the canopy horizontally will improve sunlight interception. A) Geneva Double Curtain (GDC) divides a top wire cordon system. B) A Lyre trellis divides a VSP system. Figure 5. By allowing vines to crawl along the vineyard floor for an entire season, not only can weed control be more difficult, but training also gets very messy. Vine training and trellis systems are explored in-depth in Wine Grape Production Guide for Eastern North America and Wine Grape Varieties in California. Ideally, the goal is to establish and maintain a fairly uniform vineyard to allow for easier mechanical access and management. Figure 6. Proper training makes for easier pruning and canopy management. Goffinet, M.C. 2001. Grapevine buds: construction, development, and potential for cropping. Wine East Magazine, Sept.-Oct., pp. 14ÃƒÂ¢Ã¯Â¿Â½Ã¯Â¿Â½23. L&H Photojournalism, Lancaster, PA.